LG C8 OLED vs Samsung Q9 QLED: which is better? | What Hi-Fi? LG C8 OLED vs Samsung Q9 QLED: which is better? This is, without a doubt, the TV battle of the year. Having delivered a range of good, but not exceptional, QLEDs in 2017, Samsung appeared to have lost the battle against LG’s OLEDs at the first time of asking. When self-emissive quantum dots become reality, QLED could have another crack at its technological nemesis, but as long as those quantum dots remain reliant on an LED backlight OLED will always stay ahead (we thought). Backlights are an issue because, while they can go bright, they tend to do so at the expense of black depth and can’t be controlled on a pixel-by-pixel basis in the way that OLED’s diodes can. It’s a core technical limitation that will always hand the contrast crown to OLED. Then the Samsung Q9FN came along and ripped up the rulebook. By combining quantum dots with a new, more advanced, zonally dimmable backlight, Samsung has managed to achieve something akin to a best of both worlds picture. This is a TV that goes astonishingly bright, but without sacrificing black performance, even in complex images containing elements from both extremes of the spectrum. LG, meanwhile, already thought to be close to the inherent brightness limits of OLED, has focused on software and artificial intelligence for its 2018 models. That might not sound thrilling, but software plays a huge role in the performance of a telly. And let’s not forget; LG’s 2017 TVs were already brilliant. To get those new software smarts you need to buy an LG C8, E8, G8 or W8. As the picture quality is the same across all of these models, we’ve decided to pit the cheapest one, the C8, against Samsung’s Q9FN. The smallest, most affordable version of each telly is 55in, so which is better: the Samsung QE55Q9FN or LG OLED55C8PLA? 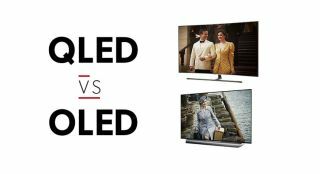 MORE: OLED vs QLED - which is the best TV technology? The LG C8 and Samsung Q9FN feature very different designs. As an OLED, the LG is supremely slim across much of its panel. The speakers, connection and processing bits and pieces require a plastic enclosure that adds thickness over the bottom third, but this is an undeniably striking design in profile. It looks good from the front, too, thanks to an elegant pedestal with a ridged, open mouth that looks like the grille of a sports car. Initially, the Samsung seems a less spectacular design. It looks smart, with a thin bezel and matte black finish, but it’s also thick and heavy. But it does have an aesthetic ace up its sleeve. The OneConnect box moves all the connections and even power to a separate unit, leaving just a single, almost impossibly thin cable running to the screen. Neatness freaks, particularly those who are wall-mounting, may find this irresistible. There’s almost nothing to choose between the two in terms of the quantity and spec of the connections. Both get four HDMI inputs, three USB sockets, and optical audio output, and both have aerial and satellite connections – two of the latter on the Samsung. The HDMIs are most important, and while neither has 2.1 certified connections (certification hasn’t yet begun), some 2.1 features have sneaked in, including support for high frame rate (HFR) on both, and variable refresh rate (VRR) on the Samsung. Is that a strong reason to buy one TV over the other? Probably not, these features are still of limited appeal right now. Of much more interest will be the differing approaches to HDR. Both TVs support HDR10, the most common HDR format, and the HLG specification preferred by broadcasters such as the BBC. But when it comes to more advanced, dynamic metadata-featuring HDR, the two TVs differ, with LG choosing to support Dolby Vision and Samsung opting for its own HDR10+ format. There are slight differences in approach and specification, but Dolby Vision currently has a big advantage when it comes to the availability of content – it has already featured on a number of 4K Blu-rays and on Apple’s 4K content, whereas HDR10+ is only available via a small number of Amazon Video shows. However, with HDR10+ expected to become more widespread by the end of the year, we’re not convinced that support for Dolby Vision is reason alone to buy the LG C8 over the Samsung Q9FN. The app selection doesn’t point to a clear winner either, with both TVs providing everything you’re likely to need. Netflix, Amazon and BBC iPlayer in their 4K HDR guises, plus all of the other UK catch-up services, Google Play Movies & TV, Rakuten and Now TV ensure all of the major bases are covered. The operating systems within which these apps are wrapped differ, but one isn’t clearly better than the other. Both are snappy, colourful and allow you to customise the apps and sources that take centre-stage. Both support voice control too, but we only occasionally find it useful. Thankfully, the remotes for each TV are both good: Samsung gives you two – an old fashioned clicker and a stripped back wand – whereas LG has a pointer-like affair. This year, LG has focused on software enhancements more than improving its panels. The result is the Alpha 9 processor, which is available on models from the C8 upwards. It brings with it a number of picture improvements: a four-part noise-reduction system, frequency-based image-sharpening, object-based contrast enhancement and adaptive colour mapping, for example. The TV can even apply dynamic metadata to HDR formats that natively carry only static metadata, resulting in features that LG refers to as HDR10 Pro and HLG Pro. Getting the best picture out of the LG C8 means avoiding the Vivid mode, which is where the advanced processing features reside. Instead, we recommend the Cinema Home preset for HDR content and Standard for everything else. And each of these needs only a little tweaking – a relief given the very confusing picture setting menus. Even with many of those fancy features disabled, this is a markedly sharper, more detailed and punchier picture than last year’s models. Of course, being an LED-backlit TV, the Samsung is significantly brighter, but it doesn’t match its brightest elements to near-perfect blacks in the way this OLED does (though it has a good stab). The result is stunning contrast from the C8. The C8’s other great strength is its colours, which are perfectly judged. It’s a wonderfully vibrant image, but one that never looks over-exaggerated. The picture is exciting, but natural and full of nuance. Skin tones are subtle and realistic, too. The Samsung takes a different approach, using its direct LED backlight to produce a thrilling image, with brightness miles beyond the LG. Images from the Q9FN are incredibly punchy, and it’s even able to reveal colours at the brightest parts of the spectrum that other TVs, the LG C8 included, miss. But don’t think of the Samsung as a blunt instrument, favouring brightness over all else. Instead, there’s surprising subtlety and nuance available here, and for a non-OLED the blacks are deep and almost entirely uniform. It’s a fabulously detailed and sharp picture, too, with the sort of edge definition that makes for a very three-dimensional image. For motion processing, the Samsung Q9FN has a small advantage over the LG C8, with the former managing to get closer to the balance of sharpness, smoothness and naturalness that only Sony has so far mastered. However, there’s a clear swing in LG’s favour for upscaling. The C8 continues the fine work of its 2017 predecessors, delivering standard-def content in exceptionally clean and controlled fashion. The Samsung is a good upscaler compared to many rivals, but not the LG. The LG also wins when it comes to viewing angles. For a backlit TV the Q9FN has good viewing angles, particularly compared to Samsung’s 2018 QLEDs, but the LG is practically perfect from any part of the room. There isn’t a TV we’ve reviewed recently that wouldn’t benefit from the addition of a soundbar or surround system, and that’s the case with the two TVs here. But, if you are relying solely on the built-in speakers, the Samsung is the better buy. Given the LG’s Dolby Atmos badge, that might come as a surprise. But while the C8 delivers an open and spacious sound that’s lent extra directness by the audio-funnelling grille on the front, the delivery is also rather thin and lacking in weight. The Q9FN isn’t quite as spacious, but it’s wide and open in its own right, and a good deal weightier and punchier than the LG, too. While the Samsung Q9FN is perhaps the more dynamic performer, particularly with HDR content, the LG C8’s balance, consistency and effortless naturalism see it take victory here by a tiny margin. And we really are talking tiny: this head-to-head is as close as these things get, despite the very different approaches of the two models. In some ways we’d have liked to have declared a tie. That would have been a cop-out, though, and ultimately we feel that the C8’s approach will suit more people more of the time. Just. At the time of writing, the two models cost exactly the same. However, with prices fluctuating regularly in this market, any significant reduction in the Samsung's price may tip our judgment in its favour. It really is that close.